MANCHESTER — Mother Nature stole the show on the opening night of the Manchester Symphony Orchestra and Chorale’s 52nd season, forcing the rescheduling of its first concert at Manchester Community College to Saturday, Nov. 19. MSOC was already preparing for a memorable evening, with the debut of the orchestra’s new music director, Cheung Chau. That night will be remembered in Manchester, but for the extraordinary October snowstorm. The heavy snowfall continued to make trouble as MSOC scrambled to reschedule the concert. Many of the orchestra members had lost power and couldn’t be reached via e-mail. More than a week after the storm, Manchester High School reopened and the orchestra resumed rehearsals. Only then was it possible to set the new date of Nov. 19. 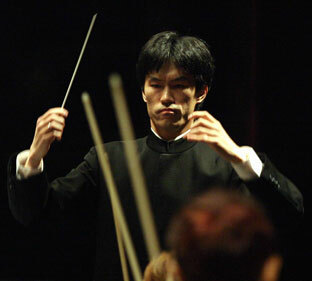 Cheung Chau will lead his debut concert Saturday as music director of the Manchester Symphony Orchestra and Chorale. Bouncing back from an unexpected event is nothing new to conductor Cheung Chau. After a hand injury temporarily interrupted his cello playing, he took up conducting and then went on to earn a double doctorate in conducting and cello from the New England Conservatory in Boston. Chau is currently director of orchestra at the University of Connecticut and cellist with the Atma Trio. Beethoven’s “Eighth Symphony” is the major work on the program, which also includes orchestral selections from Wagner’s “Die Meistersinger von Nürnberg,” Bizet’s “Carmen,” and the musical “Candide” by Leonard Bernstein. Meet Our New Conductor will be performed at 7:30 p.m. Saturday in the SBM Foundation Auditorium at Manchester Community College. All tickets for the original concert date will be honored. Tickets are $18; $15 for seniors and students, and free for those under 18 years of age.